Allow our expert team to design a private Benin tour around your exact requirements. We can include additional countries, or if you prefer mixing culture with birds or focusing on historical sites and photography, please just click on the Send An Enquiry link. The more information you provide will enable our team of experts to design that perfect holiday of a lifetime. By booking any of the wide selection of Benin tours that we offer, you can rest assured that your holiday will directly benefit locals and their environment. Ashanti African Tours have been leaders in ethical travel, putting the local communities and environment at the heart of what we do. 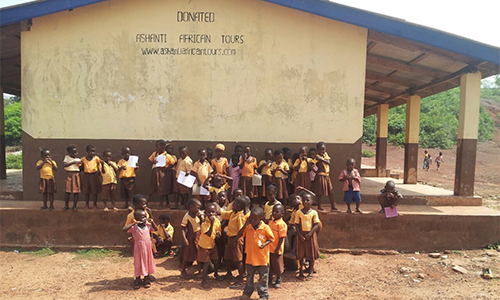 Through our ethical travel initiatives, we have been able to build an eight-classroom school facility catering for Crèche, Kindergarten and Primary school students in a coastal community. We are also currently in the advanced stages of building an eleven-classroom school for three remote communities in West Africa, as they currently do not have school facilities close to them. In addition, we are sponsoring 23 community-based committee members to patrol a portion of endangered Upper Guinea Rainforest habitat, stopping illegal logging and hunting activities. We are actively involved in protecting endangered and vulnerable bird and mammal species within West Africa. Our professional and ethically-run operations employ locals, we source the vast majority of our products and services locally and we are passionate about giving our tour participants the ultimate authentic West African experience. Many travel companies state they are into responsible travel, however this is often greenwashing to get responsible travellers to book with them. This is not the case at Ashanti African Tours and we are happy to forward more detailed information on all of our community development and environmental conservation projects, feel free to ask. If you see a * symbol it means this information is required before submitting the form for addition information.